NIVEA Men 4 Piece Energy Collection Gift Set Now Only $6.75! 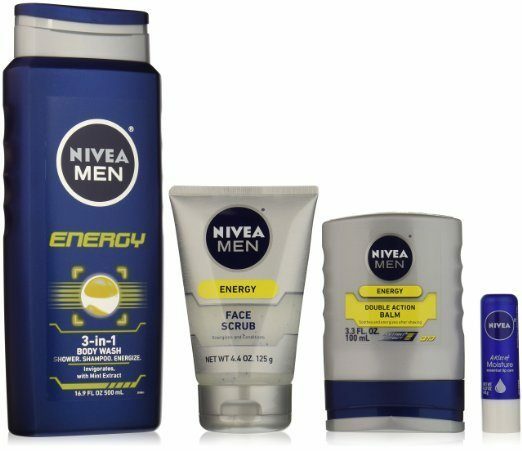 You are here: Home / Great Deals / Amazon Deals / NIVEA Men 4 Piece Energy Collection Gift Set Now Only $6.75! This Nivea Men’s Gift Set is only $9, but clip the 25% off coupon to get it for even less! Head over to Amazon and order the NIVEA Men 4 Piece Energy Collection Gift Set Now Only $6.75! This add-on item ships with any qualifying order over $25. Great for a gift! Buy now and stash for Father’s day! Energy 3-in-1 Body Wash is specially developed for men to remove dirt and sweat. Energy Face Scrub is a foaming gel containing extra fine scrub particules and vitamin E.
Energy Double Action Balm is a light, fast absorbing formula with Creatine, Coenzyme Q10 and Shea Butter.